From the age of about 12 years old, I’ve worn a “mask”, initially influenced by peer pressure, music and people in the public eye. Every day, without fail, the mask goes on – the mascara, the eye liner, the lipstick. 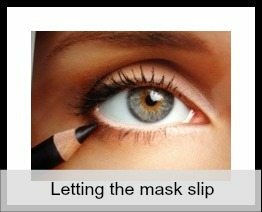 Concealer too but not foundation so the “mask” has never been a thick one. When you become a parent, the “mask” is done more rapidly, it becomes lower down on your morning routine but is still accomplished. When you find out that one or more of your children have special needs, the “mask” has an addition – sunglasses. They cover up any tears from meetings with health/school professionals. You can put them on and no-one can tell what’s happening underneath. Last Friday the morning routine was not going well. D was not co-operating and little things that she would do at the first request were taking four or five requests. She was tired, it was the end of her week but it made those few minutes before we had to leave quite frantic. Eventually we left for two school drop offs and I went to town to pick up some shopping. It was only when I glanced in a mirror in Starbucks, that I realised that the “mask” was not complete, no eyeliner! Cue inward thoughts similar to that of “The Scream” portrait. Initial panic thoughts were replaced with “I didn’t bring anything with me” and then I realised no-one had run away screaming, no-one had looked at me as if to say “how dare she be out like that”, my “mask” had slipped in public and it was…okay. I sat and drank my coffee, then headed off for some more present shopping feeling liberated, I could have gone and bought another eye-liner and put it on, but didn’t feel the need to. The eyeliner was firmly put on before the school runs later though! I have ‘the mask’. I can’t leave the house without eyeliner and mascara. And yes, it panics me if I realise I haven’t got them on. It’s funny because I doubt anyone else would notice if we didn’t wear our mask!